Dulles Toll Road drivers would pay 75 cents more at the mainline toll plaza and 50 cents more at each ramp under a proposal set to be presented Wednesday. 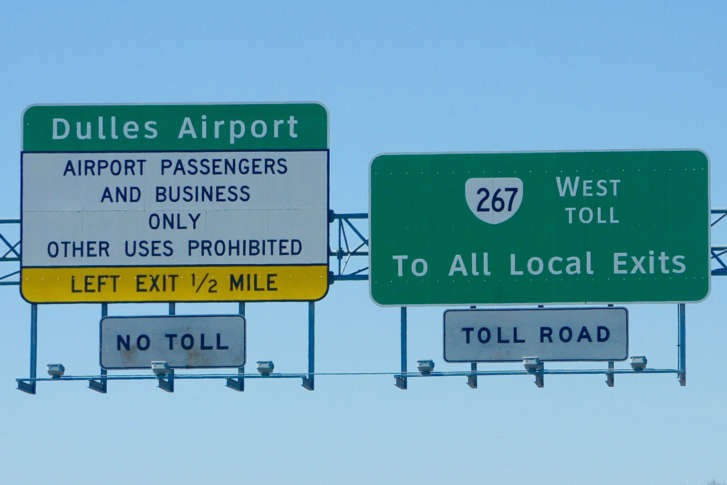 REAGAN NATIONAL AIRPORT — Dulles Toll Road drivers would pay 75 cents more at the mainline toll plaza and 50 cents more at each ramp under a proposal set to be presented Wednesday. The proposal to the Metropolitan Washington Airports Authority Board matches a 2019 toll road rate increase outlined in 2014, when tolls last rose. It would increase the cost of the most typical Dulles Toll Road one-way trip from $3.50 to $4.75. Increases would be higher for larger vehicles. A traffic and revenue study projects the airports authority would collect $198.65 million in tolls in 2019 — 29 percent more than is being collected now, even with an expected 6.4 percent drop in the number of toll transactions next year from 97,960,000 to 91,653,000. The decline is projected to come mainly on weekends or outside of rush hours, when those drivers will likely shift to Route 7 or Route 50, given the high incomes of many regular Fairfax County and Loudoun County commuters. A survey completed mainly by E-ZPass users suggested that three out of four toll road users believe the toll road saves them 10 minutes or more per trip. Usage of the road is projected to slowly rebound by about 1.5 percent each year until the next planned toll increase in 2023. The toll rates are planned to rise then to $4 at the mainline plaza and $2 at ramps including the entrance and exit to and from the Dulles Greenway. The number of transactions is already down slightly over the last several years, but the busiest times on weekdays at the mainline toll plaza remain around 8 a.m. and much of the afternoon rush westbound, and for much of the morning rush and around 5 p.m. eastbound. Route 28 is the most heavily used toll ramp plaza operated by the toll road. Public hearings on the proposed rate increases are expected to be scheduled for July 11 in McLean, July 17 in Reston and July 19 in Ashburn. While the authority is committed to a toll increase to cover debt tied to construction of the Silver Line, Chief Financial Officer Andy Rountree said they are open to shifting the increase between the mainline plaza and ramps based on public feedback. “Of course, no one likes toll increases … we have published the planned increases as far back as 2009, when we assumed responsibility for building the Silver Line, which is being financed with tolls from the Dulles Toll Road … and so we’re just being consistent with our plans to implement the tolls on the date needed,” Rountree said. The meetings, during which drivers can offer written comments or speak one-on-one with authority officials, will also seek comment on whether the toll road should consider switching to all-electronic tolling with no cash options, taking advantage of new tolling equipment that could accept credit cards, or any other improvements to toll road operations. Final action on the toll rate increases is expected in September and October. They would take effect in January. The traffic and revenue study assumed no changes to the Dulles Access Road; no widening or other major changes to the toll road, and no dynamic, variable or peak congestion toll road pricing. A new tolling system being installed is capable of supporting variable tolling options. Airports authority leaders do not believe problems with concrete used as part of Silver Line construction will create any problems that would require tolls to rise further. The project has a significant contingency fund remaining should any repairs needed not be covered by those responsible for the problems.